DNA vaccines are cost-effective, easy to make and consequently, they have great potential in clinical applications. They have also proved safe and immunogenic in animal studies. Despite this, clinical trials conducted so far have not produced satisfactory results. To this end, the optimisation of DNA delivery and expression could significantly enhance the immunogenicity in clinical trials. To enhance DNA delivery, it is important to advance the technology used to monitor its expression in vivo. Employing fluorescent proteins is one way to achieve this. Although green fluorescent protein is used extensively, it is not effective in vivo because of the skin’s absorbance and autofluorescence characteristics. To overcome this issue, far red fluorescent proteins may be used to facilitate improved imaging. Nevertheless, most of the clinical trials that reported the use of these proteins have used recombinant viruses; injected cells expressing the proteins; or used recombinant protein in an artificial mouse. This article examines the technique used to optimise the conditions required to visualise protein after DNA vaccination. For the study, a plasmid expressing the red fluorescent protein tdTomato under a CMV promoter (pCSCMV:tdTomato; Addgene) was prepared for in vivo use. Before immunization, mice (female BALB/c mice, 6 to 8 weeks old; Harlan Scientific) were initially shaved and treated with depilatory cream in the area under study. Following this, 50 μg of DNA was injected into the mice either subcutaneously or intramuscularly, with or without electroporation. It has been demonstrated that electroporation can considerably enhance the expression of DNA vaccines. The same was administered using a fixed gap needle electrode that was inserted within the muscle after the injection. The Bruker In-Vivo MS FX PRO system was used to image the mice at excitation 550 nm and emission 600 nm. Images were then acquired with 1x1 binning, f-stop 2.8 and 60 second acquisition time. 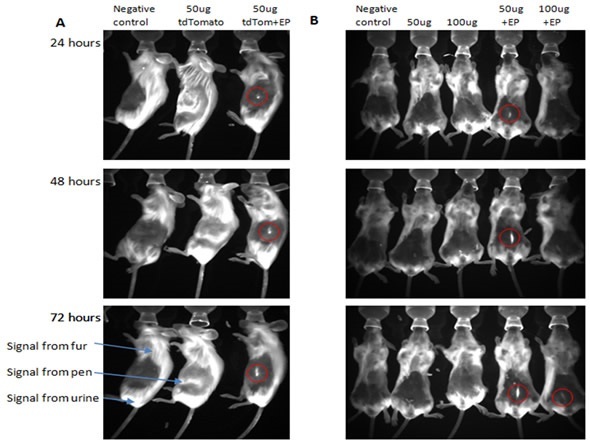 In order to prevent auto-fluorescence at the imaging site, mice were first shaved and depilated and then Image analysis was performed with the help of the Bruker Molecular Imaging Software Suite. Several approaches were used to reduce this background noise, including the use of ear punch to identify mice as well as the shaving and depilating procedures. Figure 1. Electroporation considerably improves intensity of fluorescent protein expression in vivo. (B) Mice injected subcutaneously in the central epigastric region with 50 or 100 μg tdTomato with or without electroporation. Red circle denotes the area of fluorescent protein expression. Once the noise signal was reduced, comparison was made on the expression of tdTomato from plasmid DNA administered with and without electroporation. Since electroporation can improve the expression of DNA vaccines, this aspect was applied to ascertain whether it could influence the expression of fluorescent proteins in vivo. From the above figure, it is clear that electroporation considerably improved the signal perceived and there seems to be no difference in expression between the 50 and 100 μg groups. Hence, for forthcoming studies, 50 μg with electroporation was used. The route of immunisation was the other aspect of DNA vaccination of interest. For this, subcutaneous immunisation was compared with intramuscular immunisation. It was seen that when successful, intramuscular immunisation appeared to give a stronger signal; however, it was less reliable on the whole when compared to subcutaneous immunisation (Figure 2). Figure 2. Comparison of routes of immunisation. 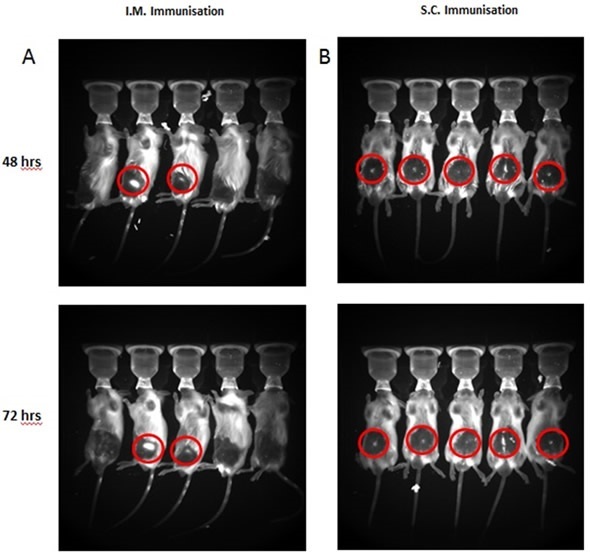 BALB/c mice were intramuscularly (A) and subcutaneously (B) immunised with electroporation with 50 µg of tdTomato plasmid. Imaging was performed at 48 h and 72 h at excitation 550 nm and emission 600 nm. The tdTomato-encoding DNA can be effectively administrated through electroporation and offers a suitable tool for in vivo vaccination with DNA. Nevertheless, using red fluorescent proteins for in vivo imaging of delivered DNA is rather difficult. Even within the red spectrum, several sources of noise can occur within the experiment. Hence, strongly expressing/fluorescing proteins and meticulous preparation of animals can help in reducing this problem. Moreover, the availability of red emitting fluorescent proteins, such as the mKate2 or IFP, may greatly enhance in vivo imaging capabilities. Produced from articles authored by E. Kinnear, R. Cole, A. Walters, R. Shattock, J. Tregoning, Mucosal Immunity Group, Department of Medicine, St Mary’s Campus, Imperial College London, London, W2 1PG, UK. Dedecker P, De Schryver FC, Hofkens J. Fluorescent Proteins: Shine on, You Crazy Diamond. J Am Chem Soc 2013 Jan 14;135(7):2387-402. Shcherbakova DM, Subach OM, Verkhusha VV. Red Fluorescent Proteins: Advanced Imaging Applications and Future Design. Angew Chem Int Ed 2012 Oct 22;51(43):10724-38. Shcherbo D, Shemiakina II, Ryabova AV, Luker KE, Schmidt BT, Souslova EA, et al. Near-infrared fluorescent proteins. Nat Methods 2010 Oct;7(10):827-9. Shu X, Royant A, Lin MZ, Aguilera TA, Lev-Ram V, Steinbach PA, et al. Mammalian expression of infrared fluorescent proteins engineered from a bacterial phytochrome. Science 2009 May 8;324(5928):804-7. Deliolanis NC, Kasmieh R, Wurdinger T, Tannous BA, Shah K, Ntziachristos V. Performance of the red-shifted fluorescent proteins in deep-tissue molecular imaging applications. J Biomed Opt 2008 Jul;13(4):044008. Waldner C, Roose M, Ryffel GU. Red fluorescent Xenopus laevis: a new tool for grafting analysis. BMC Dev Biol 2009;9:37. Gothelf A, Eriksen J, Hojman P, Gehl J. Duration and level of transgene expression after gene electrotransfer to skin in mice. Gene Ther 2010 Jul;17(7):839-45.